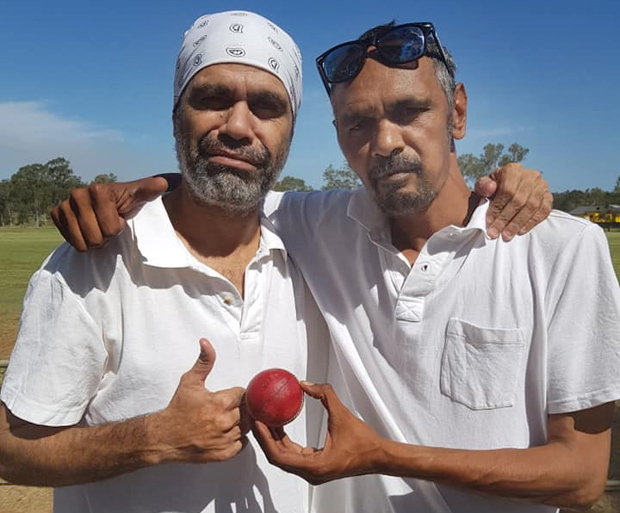 Terry Davidson took the first hat-trick, followed soon afterwards by Danny Weazel, as Cherbourg ripped through the Wondai batting line-up (full results below). 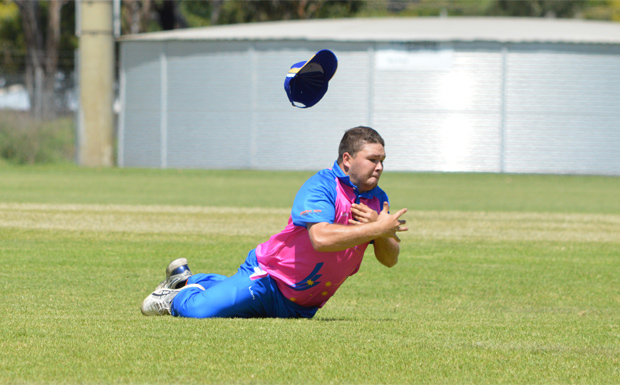 “We are very proud of our two bowlers … two hat-tricks in one game is awesome,” captain Barry Fisher Snr said. Barry is also on a hat-trick for the next game, taking the last two wickets of the match. 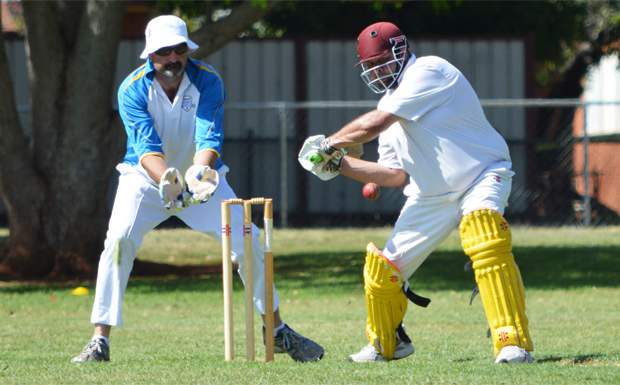 Cherbourg defeated Wondai by eight wickets at Wondai on Saturday. Wondai won the toss and elected to bat but were all out in the 13th over for just 35 runs. Opener Chris Heness top-scored with 24. Terry Davidson wasn’t far behind, taking 3/19 off five overs (with two maidens). Barry Fisher Snr took 2/1 off 1.3 overs. In reply, Cherbourg easily made the target, losing just two wickets. Mick Rees top-scored with 11 not out. Jeremy Hobbs was the best of the Wondai bowlers, taking 1/1 off four overs (including two maidens). At Taabinga State School Oval, Murgon District proved too good for Kingaroy Services. Kingaroy won the toss and batted first. At the end of their 40 overs, the home team were 7/175. 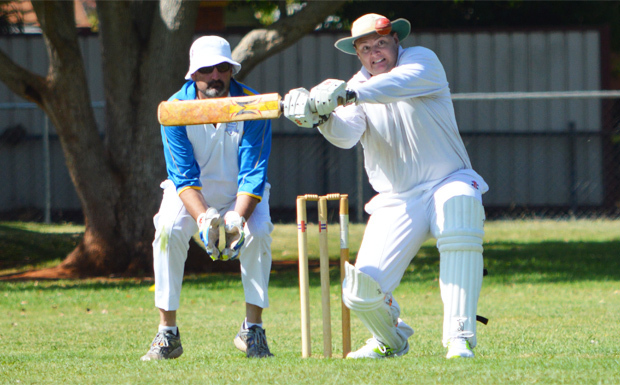 Edwin Simpson (74) and Justin Labinsky (39 not out) were the top scorers. Paul Taylor (3/22) and Renee Irving (1/17) were the best of the Murgon bowlers. Murgon passed Kingaroy’s in the 23rd over to finish 4/184. Nicholas Sanewski (38), Jonathan Kapernick (31) and Robert Zelinski (26) all contributed well with the bat. At Blackbutt, Kumbia won the toss and elected to bat against the Timbertowners. The Rattlers were all out for 155 in the 23rd over. Opener Shane Laherty (33) and Corey Cross (30) both made good starts but tail-ender Karl Freeman was the top-scorer with 50 not out. Zac Ennis (4/65 off eight overs) and Kieran Harvey (3/44 off seven) were the pick of the Blackbutt bowlers. In reply, Blackbutt overtook the target in 26 overs, finishing 5/156. Kieran Harvey was best with the bat, finishing 56 not out. Dusty Allery made a handy 25 and Jamie Kruger 29. Corey Cross (3/34 off eight), Karl Freeman (1/21 off four) and Ryan Kelly (1/3 off one) were the best of Kumbia bowlers. Blackbutt won by five wickets. At Nanango Sportsground, the home team were too strong for Kallindale Warriors. Warriors won the toss and batted first. They were all out for 173 in the 39th over. Dane Bloomfield (32) and Tavis Hartwig (27) top-scored for Warriors. Sam Scott took 3/46 off his eight overs for Nanango. In reply, the Scorpions passed the target in 24 overs, finishing with 4/189. Stephen Kirkland (74) and Hayden Harch (44) made the bulk of the runs. Tavis Hartwig (1/9 off five overs) and J Reilly (1/20 off four) were the best of the Warriors’ bowlers. A local derby was played in the Gympie cricket competition, with Southern Districts Devils hosting Murgon Crusaders at Lyle Vidler Oval. Devils won the toss and elected to bat. What followed was a close game, with Murgon eventually coming out on top with three wickets in hand and just 11 balls to spare. The home side was all out for 178. Opener Hayden Wieck hit 12 fours and one six on his way to his top-score of 75. Lleyton Brown (47) and Jack Hourn (21) added valuable runs to the Devils’ score. Bryce Edwards was the best of the Murgon bowlers, taking 3/13 off six overs, including one maiden. Chris Medcalf (3/18 off five) also proved deadly. In reply, Crusaders were 7/180 off 38.1 overs. Opener Jason Webber stayed at the crease for more than two hours to top score with 89. Chris Medcalf (38 not out) and Allen Ledger (21) added more valuable runs. Kieran Askin (4/24 off eight overs) and Tyler Heness (3/29 off six) were the best of the Southern Districts’ bowlers. 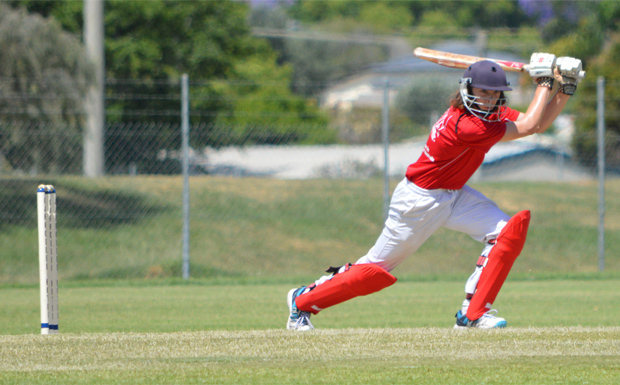 Murgon cricketer Courtney Sippel, 17, was named in the Queensland Fire squad for this weekend’s Women’s National Cricket League round in Hobart. Three slots opened up in the side as Jess Jonassen, Beth Mooney and Delissa Kimmince are in the West Indies with the Australian XI. The full squad is: Kirby Short (c), Jemma Barsby, Haidee Birkett, Tess Cooper, Meagan Dixon, Josie Dooley, Jess Duffin, Grace Harris, Laura Harris, Sammy-Jo Johnson, Charli Knott, Georgia Prestwidge and Courtney Sippel. Regarding the comment that Barry Fisher Snr will be on a hat-trick with the first ball he bowls in the next game. Unfortunately this is not correct. Once the game is completed so is the batting and bowling figures. If the game was a two innings game then a bowler who takes the last 2 wickets of the first innings can complete the hat-trick by taking a wicket with first ball he bowls in the second innings. It can not be carried over to another game. The same is with batting – if a player is 99 not out when the game is completed, he can not start his next game on a score of 99.